Artist Laurel Burch strove to create magical images that would remind people of the world of the spirit. Image measures approximately 1-1/2" X 2-1/4". This original design is copyright Laurel Burch. It is deeply etched and precision cut from premium gray rubber on a 1/8" gray rubber foam backing then mounted on a cling vinyl decal with full sized image for easier storage and use with an acrylic handle sold separately. Made in the USA. Artist Laurel Burch strove to create images that would remind people of the ongoing world of the spirit. Magical, beautiful images that will give you the freedom of expression to color and enjoy. This original design is copyright Laurel Burch. It is deeply etched and precision cut from premium gray rubber on a 1/8" gray rubber foam backing then mounted on a cling vinyl decal with full sized image for easier storage and use with an acrylic handle sold separately. Made in the USA. Image measures approximately 2-3/4" X 2-3/4". 7 Stamps plus FREE Stencil/Mask/Template. Artist Laurel Burch strove to create images that would remind people of the ongoing world of the spirit. Magical, beautiful images that will give you the freedom of expression to color and enjoy. Largest cat stamp measures approximately 2.5" X 3.75". 7 pieces including template/stencil/mask for more creative options. Laurel Burch stamp from Stampendous featuring the inspirational sentiment "listen... you can hear the colors flowering in the quiet of your soul". Image measures approximately 1 1/2" x 2 1/4". 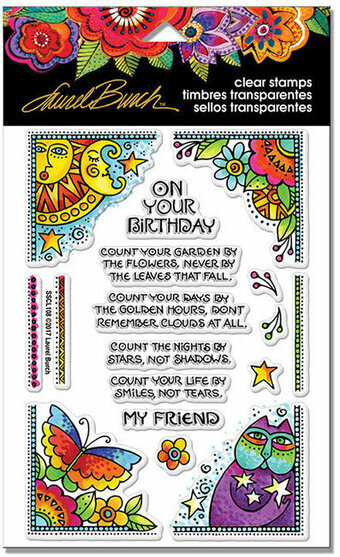 Laurel Burch stamp from Stampendous featuring cats, flowers, and the sentiments "happy birthday", "my friend", "thank you". Largest image measures approximately 3 3/8" x 2 7/8". 7 Stamps plus FREE Stencil/Mask/Template. Laurel Burch stamp from Stampendous featuring a mermaid and fish in an underwater scene. Image measures approximately 2-3/4" X 4-1/4". Laurel Burch stamp from Stampendous featuring 2 dogs together. Image measures approximately 2-1/4" X 2-3/4". Artist Laurel Burch strove to create images that would remind people of the ongoing world of the spirit. Magical, beautiful images that will give you the freedom of expression to color and enjoy. Image measures approximately 3-3/4" X 3-3/4". This original design is copyright Laurel Burch. It is deeply etched and precision cut from premium gray rubber on a 1/8" gray rubber foam backing then mounted on a cling vinyl decal with full sized image for easier storage and use with an acrylic handle sold separately. Made in the USA. Artist Laurel Burch strove to create images that would remind people of the ongoing world of the spirit. Magical, beautiful images that will give you the freedom of expression to color and enjoy. This original design is copyright Laurel Burch. It is deeply etched and precision cut from premium gray rubber on a 1/8" gray rubber foam backing with full-sized image for easier storage and use with an acrylic handle, sold separately. Largest Butterfly Image measures approximately 4" X 2-1/2". 7 Stamps plus FREE Stencil/Mask/Template. Cats and a dog chase around the celestial sun. Image measures approximately 3-3/4" X 3-3/4". This original design is copyright Laurel Burch. It is deeply etched and precision cut from premium gray rubber on a 1/8" gray rubber foam backing then mounted on a cling vinyl decal with full sized image for easier storage and use with an acrylic handle sold separately. Made in the USA. Artist Laurel Burch strove to create images that would remind people of the ongoing world of the spirit. Magical, beautiful images that will give you the freedom of expression to color and enjoy. This original design is copyright Laurel Burch. It is deeply etched and precision cut from premium gray rubber on a 1/8" gray rubber foam backing then mounted on a cling vinyl decal with full sized image for easier storage and use with an acrylic handle sold separately. Made in the USA. Top left horse Image measures approximately 2-1/2" X 2-1/2". 7 Stamps plus FREE Stencil/Mask/Template. This framed, holly cat is ideal as a card focal point or home decor project. Image measures approximately 4" X 4". This original design is copyright Laurel Burch. It is deeply etched and precision cut from premium gray rubber on a 1/8" gray rubber foam backing then mounted on a cling vinyl decal with full sized image for easier storage and use with an acrylic handle sold separately. Made in the USA. An image of peace and tranquility for the Christmas season. Image measures approximately 4" X 5-1/4". This original design is copyright Laurel Burch. It is deeply etched and precision cut from premium gray rubber on a 1/8" gray rubber foam backing then mounted on a cling vinyl decal with full sized image for easier storage and use with an acrylic handle sold separately. Made in the USA. The spirit of the Reindeer is celebrating the Christmas season. Image measures approximately 3" X 4-1/2". This original design is copyright Laurel Burch. It is deeply etched and precision cut from premium gray rubber on a 1/8" gray rubber foam backing then mounted on a cling vinyl decal with full sized image for easier storage and use with an acrylic handle sold separately. Made in the USA. Artist Laurel Burch strove to create images that would remind people of the ongoing world of the spirit. Magical, beautiful images that will give you the freedom of expression to color and enjoy. Image measures 3.75" x 3.75". Features the sun, moon, and stars hanging in the sky. Artist Laurel Burch strove to create images that would remind people of the ongoing world of the spirit. Magical, beautiful images that will give you the freedom of expression to color and enjoy. Image measures 3.75" x 5". Features lots and lots of cats. Artist Laurel Burch strove to create images that would remind people of the ongoing world of the spirit. Magical, beautiful images that will give you the freedom of expression to color and enjoy. Woman stamp measures approximately 4" X 4.5". 7 pieces including templat/stencil/mask for more creative options. Artist Laurel Burch strove to create images that would remind people of the ongoing world of the spirit. Magical, beautiful images that will give you the freedom of expression to color and enjoy. Image measures 2.75" X 2.25". Features a large cat face. Laurel Burch Curio Rubber Stamps are sweet, colorful, wooden sculptures ideal for decorating your crafting area or giving to crafty friends. On the back of each, you'll find a matching rubber stamp in our finest gray rubber, closely trimmed, with black foam cushion for the Stampendous impression you've come to expect from our products. Laurel Burch Cat measures approximately 2"w X 3"h X 1-1/8"d and stands on its own. Artist Laurel Burch strove to create images that would remind people of the ongoing world of the spirit. Magical, beautiful images that will give you the freedom of expression to color and enjoy. It is deeply etched and precision cut from premium gray rubber on a 1/8" gray rubber foam backing then mounted on a cling vinyl decal with full sized image for easier storage and use with an acrylic handle sold separately. Made in the USA. Image measures approximately 2-3/4" X 4-1/4". Artist Laurel Burch strove to create magical images that would remind people of the world of the spirit. Image measures approximately 2-3/4" X 4-1/4". This original design is copyright Laurel Burch. It is deeply etched and precision cut from premium gray rubber on a 1/8" gray rubber foam backing then mounted on a cling vinyl decal with full sized image for easier storage and use with an acrylic handle sold separately. Made in the USA. This charming cat has a friendly bird perched on his tail. Image measures approximately 2-3/4" X 2-3/4". This original design is copyright Laurel Burch. It is deeply etched and precision cut from premium gray rubber on a 1/8" gray rubber foam backing then mounted on a cling vinyl decal with full sized image for easier storage and use with an acrylic handle sold separately. Made in the USA. Artist Laurel Burch strove to create images that would remind people of the ongoing world of the spirit. Magical, beautiful images that will give you the freedom of expression to color and enjoy. Image measures approximately 3-3/4" X 5". It is deeply etched and precision cut from premium gray rubber on a 1/8" gray rubber foam backing then mounted on a cling vinyl decal with full sized image for easier storage and use with an acrylic handle sold separately. Made in the USA. Artist Laurel Burch strove to create magical images that would remind people of the world of the spirit. Image measures approximately 2-3/4" X 4-1/4". This original design is copyright Laurel Burch. It is deeply etched and precision cut from premium gray rubber on a 1/8" gray rubber foam backing then mounted on a cling vinyl decal with full sized image for easier storage and use with an acrylic handle sold separately.. Made in the USA. Artist Laurel Burch strove to create images that would remind people of the ongoing world of the spirit. Three magical, beautiful images that will give you the freedom of expression to color and enjoy. Deeply etched and precision cut from premium gray rubber on a 1/8" gray rubber foam backing then mounted on Stampendous Cling Rubber. Featuring a dog with 2 puppies, another small puppy, and the sentiment "love you more." In true Laurel Burch style a striped kitty and spotted dog peek around Christmas trees in this fun and festive set. Four cling rubber stamps and three precision, stainless steel cutting dies allow you to make 3-D holiday greetings with ease. Laurel Burch stamp from Stampendous featuring a passionate kiss. Image measures approximately 2-1/4" X 2-3/4". Artist Laurel Burch strove to create magical images that would remind people of the world of the spirit. Image measures approximately 2" X 3-1/4". This original design is copyright Laurel Burch. It is deeply etched and precision cut from premium gray rubber on a 1/8" gray rubber foam backing then mounted on a cling vinyl decal with full sized image for easier storage and use with an acrylic handle sold separately. Made in the USA. Artist Laurel Burch strove to create images that would remind people of the ongoing world of the spirit. Three magical, beautiful images that will give you the freedom of expression to color and enjoy. Deeply etched and precision cut from premium gray rubber on a 1/8" gray rubber foam backing then mounted on Stampendous Cling Rubber. Featuring a butterfly and the sentiments "be the change", "await the miracle". 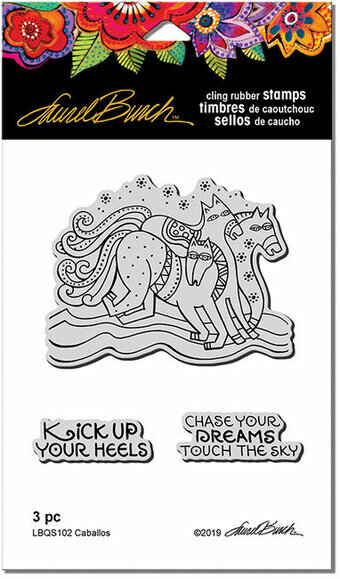 Laurel Burch Curio Rubber Stamps are sweet, colorful wooden sculptures ideal for decorating your crafting area or giving to crafty friends. On the back of each, you'll find matching stamp images in our finest gray rubber, closely trimmed, with black foam cushion for the Stampendous impression you've come to expect from our products. Laurel Burch Dog measures approximately 3"w X 2-3/4"h X 1-1/8"d and stands on its own. A special kitty wishes you a happy day with a bunch of flowers. This original design is copyright Laurel Burch. It is deeply etched and precision cut from premium gray rubber on a 1/8" gray rubber foam backing then mounted on a cling vinyl decal with full sized image for easier storage and use with an acrylic handle sold separately. Made in the USA. Artist Laurel Burch strove to create magical images that would remind people of the world of the spirit. Image measures approximately 3-3/4" X 3-3/4". This original design is copyright Laurel Burch. It is deeply etched and precision cut from premium gray rubber on a 1/8" gray rubber foam backing then mounted on a cling vinyl decal with full sized image for easier storage and use with an acrylic handle sold separately. Made in the USA. Artist Laurel Burch strove to create images that would remind people of the ongoing world of the spirit. Magical, beautiful images that will give you the freedom of expression to color and enjoy. This original design is copyright Laurel Burch. It is deeply etched and precision cut from premium gray rubber on a 1/8" gray rubber foam backing then mounted on a cling vinyl decal with full sized image for easier storage and use with an acrylic handle sold separately. Made in the USA. Mermaid image measures approximately 3.75" X 3.75". 7 stamps plus FREE Stencil/Mask/Template. Laurel Burch stamp from Stampendous featuring 2 nuzzling horses and a heart. Image measures approximately 2-3/4" X 2-3/4". Artist Laurel Burch strove to create magical images that would remind people of the world of the spirit. Image measures approximately 1-1/2" X 3-3/4". This original design is copyright Laurel Burch. It is deeply etched and precision cut from premium gray rubber on a 1/8" gray rubber foam backing then mounted on a cling vinyl decal with full sized image for easier storage and use with an acrylic handle sold separately. Made in the USA. Artist Laurel Burch strove to create images that would remind people of the ongoing world of the spirit. Magical, beautiful images that will give you the freedom of expression to color and enjoy. Image measures approximately 3-3/4" X 3-3/4". It is deeply etched and precision cut from premium gray rubber on a 1/8" gray rubber foam backing then mounted on a cling vinyl decal with full sized image for easier storage and use with an acrylic handle sold separately. Made in the USA. Artist Laurel Burch strove to create images that would remind people of the ongoing world of the spirit. Magical, beautiful images that will give you the freedom of expression to color and enjoy. Image measures 3.75" X 5". Features a vase filled with flowers.